Thursday night I introduced my 7 year old daughter to the Powerpuff Girls television show on Netflix. Later that night I remembered I had, back in the day, bought a ton of the Powerpuff comic books for my wife. Saturday morning I went up to the attic to see what I could find. I wound up bringing down 60 or so issues. I figured they would entertain her for a good while. Well, it is now Sunday night and she had read every single issue. 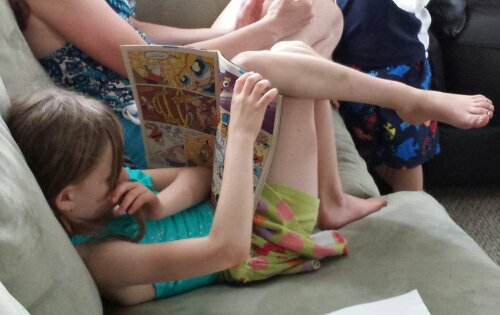 So yeah,my girl likes comics add much add I did as a kid. I could not be happier. Sad, fascinating article about a man whose life and feeling of self-worth was overturned like so many others by the economic downturn. And so he decided to walk from Seattle to Brazil, hoping to arrive before the 2014 World Cup. I’m always fascinated by these articles about people who can just cut ties to basically everything in their life and just go on these quests. I love reading these tales because this is pretty much the opposite of me. I’ve always been responsible to something, be it school, or a job, or a mortgage, or a family that I could not fathom risking/discarding it to go on an epic quest. There is a romanticism about that freedom, I think, that could never live up to the reality of it (read the article for a concrete example of this). Anyway, give the article a look. I think you will enjoy it. Two weeks before Richard Swanson started dribbling a soccer ball to Brazil, his friends toasted him with a boot of dark wheat beer at his favorite German pub. Die Bierstube is in Seattle’s Roosevelt neighborhood,1 near the University of Washington. It sits on a street lined with yoga studios, Pilates studios, a nonprofit no-kill animal rescue, and a center for healing arts that offers classes in Feldenkrais, Chi Kung, dance, interplay, Tui Na, yoga, and transformational breathing. The East West Bookshop, a block north of the tavern, sells crystals, incense, and hardcovers with titles like Buddhist Boot Camp, How to Meditate, and Breaking the Habit of Being Yourself. via Richard Swanson died while trying to walk from Seattle to Brazil for the 2014 World Cup – how far did he want to break away? – Grantland. May we all be comfortable enough with ourselves to dance like this dude.